With the T1500G-10PS JetStream 8-Port Gigabit PoE Managed Switch with 2 SFP Slots from TP-Link, you can power a variety of PoE-compatible devices such as IP cameras, access points, and more. This switch supports the 802.3af PoE network standard with a PoE power budget of 53W. 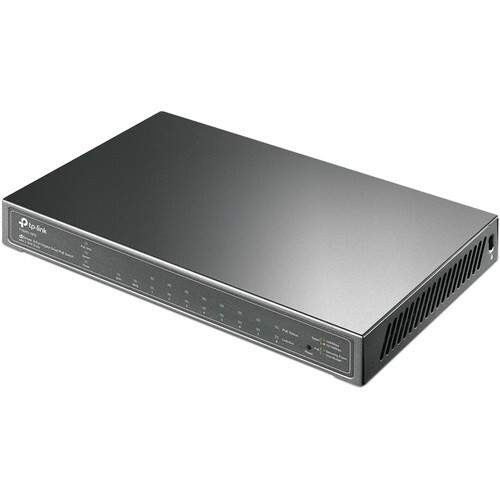 In addition to PoE support, the T1500G-10PS comes equipped with eight Gigabit Ethernet ports that offer full-speed data transfer capabilities. Once installed, network administrators can utilize a variety of network security features including IP-MAC-Port Binding, ACL, Port Security, DoS Defend, Storm Control, DHCP Snooping, 802.1X, and Radius Authentication to ensure the network remains secure. Network traffic can be prioritized to be sure voice and video applications operate smoothly thanks to QoS functionality including L2/L3/L4 QoS and IGMP snooping functionality. Managing the network has also been simplified with WEB/CLI managed modes, as well as SNMP, and RMON support. The T1500G-10PS supports 8 ports of IEEE 802.3af-compliant PoE and has a total power budget of 53W to power any 802.3af compliant power device. It's an efficient and cost-effective choice to work with wireless access points, surveillance cameras, IP phones, and other PoE supported devices, while getting rid of cables or power lines. Compact and flexible, the T1500G-10PS is ideal to flexibly use PoE to deploy wireless access points or IP-based network surveillance cameras for projects or small business networks. To integrate voice, data, and video service on one network, the switch applies rich QoS policies. Administrators can designate the priority of the traffic based on a variety of means including Port Priority, 802.1P Priority, and DSCP Priority, to ensure that voice and video are always clear, smooth and jitter free. In conjunction with the supported Voice VLAN, voice applications will operate with much smoother performance. For more application of layer 2 switches, the T1500G-10PS supports a complete lineup of layer 2 features, including 802.1Q tag VLAN, Port Isolation, Port Mirroring, STP/RSTP/MSTP, Link Aggregation Control Protocol, and 802.3x Flow Control function. Furthermore, this switch provides advanced features for network maintenance such as Loop Back Detection, Cable Diagnostics and IGMP Snooping. IGMP Snooping ensures the switch intelligently forward the multicast stream only to the appropriate subscribers while IGMP throttling and filtering restrict each subscriber on a port level to prevent unauthorized multicast access. The T1500G-10PS is easy to use and manage. It supports various user-friendly standard management features, such as intuitive web-based Graphical User Interface(GUI) or industry-standard Command Line Interface(CLI). SNMP (v1/2/3) and RMON support enables the switch to be polled for valuable status information and send traps on abnormal events. Box Dimensions (LxWxH) 12.4 x 9.5 x 2.7"